Snowshoes were a significant asset to people in snow areas when traveling and hunting during the winter months. Many archeologists feel that available evidence indicates that skis/snowshoes originated in Central Asia about 4000 B. C. Eskimos and American Indians and even the Plains Indians used them to great advantage when hunting large animals which would sink into deep snow and become helpless. Some snowshoes that were longer and narrower in design would allow the wearer to travel quickly over packed snow and the more oval (bear paw) design was more efficient on fluffy light snow. 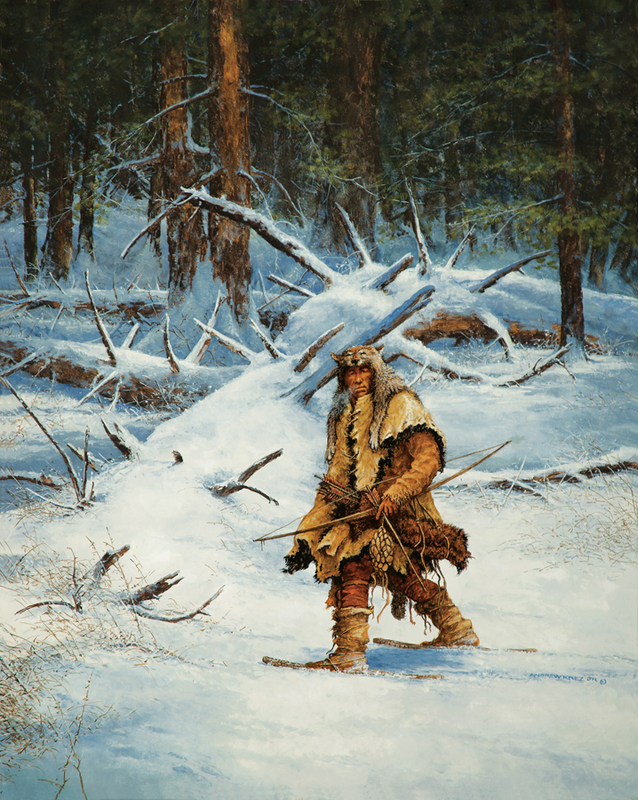 Large animals looked for shelter from winter’s frigid winds in wooded valleys and hunters wearing warm animal fur clothing and carrying bows could approach their prey closely where a well-placed arrow would provide food for his family.